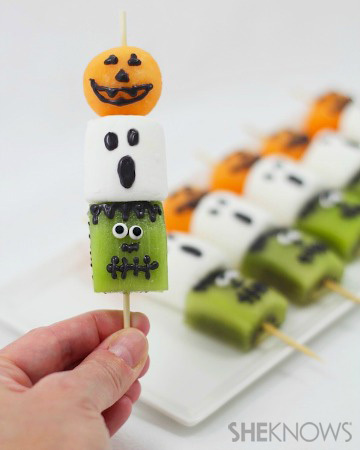 We definitely don’t want to be those adults who forbid their kids to eat Halloween candy and hand out raisins and toothbrushes to trick-or-treaters — but is it too much to ask for kids to consume just a little something healthy during the month of October? Being that there’s so much glorious temptation this season, it seems like a tall order to ask the little hands to step away from the candy. 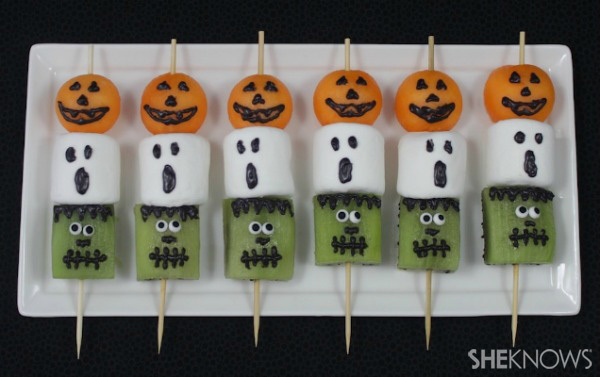 However, with some clever disguising, it’s totally possible to sneak in some produce, like these adorable monster-inspired fruit kebabs. Using a melon baller tool, make round balls of cantaloupe. Cut the kiwis into squares of similar size. 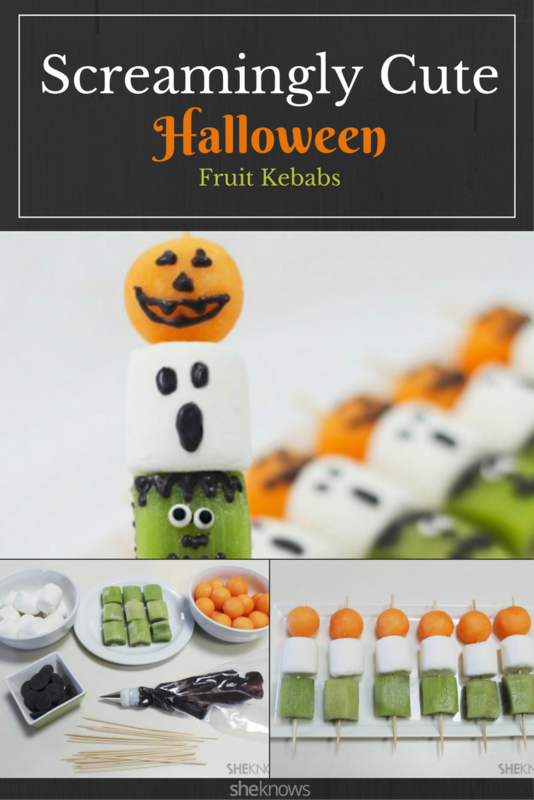 Assemble the fruit kebabs onto the small wooden skewers — cantaloupe, marshmallow and kiwi. Put them in the refrigerator for an hour to chill. Melt the black candy melts in the microwave until smooth. Pour into the piping bag with small, round piping tip. With a paper towel, dab off any moisture on the fronts of the fruit kebabs. 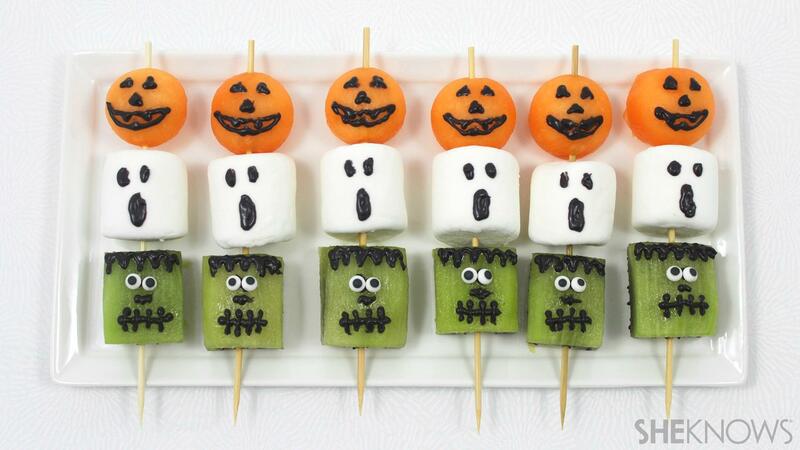 Pipe black candy melt faces on the fronts of the cantaloupe pumpkins, marshmallow ghosts and Frankenstein kiwis. If using icing eyes on the Frankenstein kiwis, apply a tiny dot of candy melt to the kiwi before adding the eyes. Arrange the kebabs on a tray or plate, and chill them for an hour before serving. These are best if served within 24 hours of preparation.